Welcome to a touch of Halloween madness as we prepare for our bewitching day. 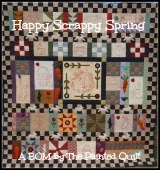 To Be Sew for all the work you do in planning these blog hops. Make sure you visit her blog everyday for a free Halloween pattern. Midnight Madness is a 2017 Row By Row kit. It was created by Cobwebs And Caviar from Shelburne, Ontario and is one of my favorite designs in this years rows. I love the fashionable witch. Every witch deserves their own home. Bloggers were gifted with a pattern and my choice was a haunted house. I figured a skeleton doorman was appropriate. But one haunted house was not enough so I created a village. I am machine quilting and using the quilt as you go method. I need to dream up a few more rows to complete the quilt. Not my creation but when I visited family they were in the Halloween spirit. Squares of fleece poked into a foam wreath and wound with spooky trim ~~ perfect for using up scraps creatively. Too good not to share. I hope you do not have to spend time with the Grim Ripper. He comes out every Halloween. 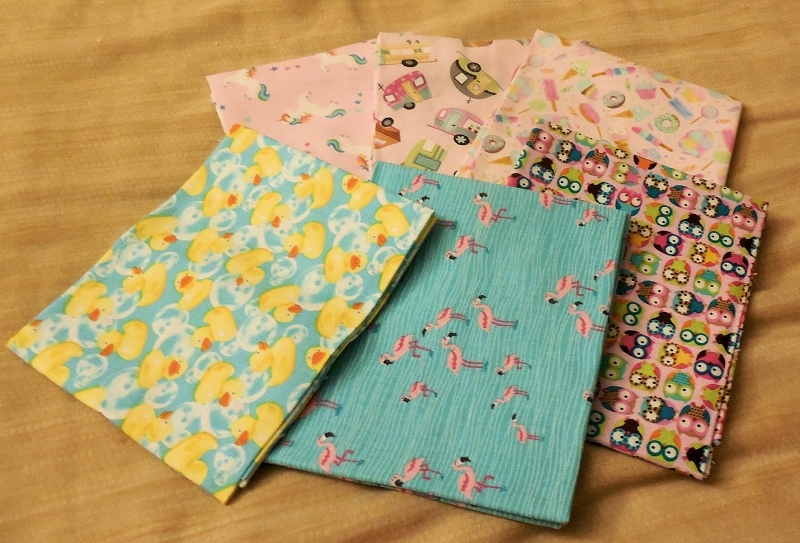 If you would like to win this lovely fabric bundle make sure you comment and complete the Rafflecopter Giveaway below. Your village is just delightful! Thanks so much for sharing. I absolutely love all the details that you included in each block! All those characters and little surprises are too perfect!! Thanks for sharing!! I really like the detail in your village! Wow, you have done a lot of sewing! I love your Halloween village--well, all of it is really neat, but that's my favorite. Thanks for sharing! What great Halloween designs. I have wanted to make the grim ripper for a while! Love your little town - I especially like the little spider dangling in the last picture. I put a spider web in all of my projects. Love your scary little town! I love, love, love that row of spooky houses! The Grim Reaper is a scary kind of guy! Really like the Spooky Smiley. Your skeleton in the doorway is the perfect touch! I love the spooky town, too! I love your spooky houses!! Great job in your creation. Your Row is so cute. Thank You.. This village is just adorable! I love your projects. I love to decorate for the seasons, and you have given me some great ideas. Your haunted houses and your adorable tote are so cute - I need to dig out some Halloween scraps and get cracking! Cute, your witch is in a big hurry. Love that haunted house row and the convenience of broom parking. Cute, cute. Such a great Halloween project. Halloween is so much fun to create unique items! All of your projects are darling. I especially like the witch! Your village is great! I like how you expanded from the haunted house. How clever! I am so great at copying the ideas of others rather than originating so I really admire the creators! The house are wonderfully haunting. What a great selection of projects. The village is darling and the tote bag (spooky). Grrrl, you've gone all out and I love it! Thanks for the opportunity, I love Halloween! Love the patterns and Halloween! GO LIL WITCH! SUCH NEAT PROJECTS! THANKS FOR SHARING! So many cute ideas! I'm getting inspired to make some Halloween decorations. Awesome! I love your Halloween projects! Too darling! Thanks for sharing! I love witches. Very nice. I love your haunted village and especially love the Halloween wreath "hats". Thanks! I love your haunted house with the skeleton doorman. The haunted village is fantastic! Fun Creations! Very cute row. Well, you certainly got my hauntingly happy attention! LOVE your projects...they put me right in the spirit! Haunted houses - all the rage and I love your village! Really cute! I love the details. The houses are sew cute! I love the row by row Halloween Theme! Your Witches Home is wonderful and will look fabulous on a table! I love all your projects! You did a fantastic job. The Halloween Houses are great! I love the creepy village! I love your haunted village. Love the spooky village and all it's little details, very cute! Love your village you created! How creative to make an entire village! Excellent work! What a fun project. Happy Halloween. Lovely designs! 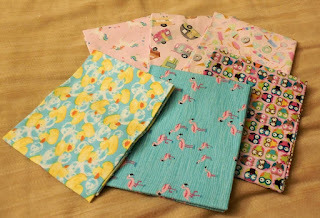 But I am very confused about how to obtain the free pattern in this Blog Hop from Seams to Be Sew. Please help, thank you! I love your row and the town. Thanks for sharing. Great projects! Thank you for sharing. I love your haunted village and the row by row. Thanks for designing them. Sew much fun! I love the haunted village. Love your Halloween village. Sew cute! Fun post! I like the haunted village. I love your witch and the Halloween village! I love your haunted village! I would like to make one of those for myself. Wonderful project! The village is great. Cute village. Your little friend on the bag is cute too. Love all your adorable projects. I especially like the Halloween village. I like your crooked houses! What a cute village, I love all the details! Midnight Madness row is cute.